Recently, Miss 3 has begun to demonstrate significant separation anxiety at her day care drop offs. She becomes clingy, and desperately upset when I tell her I am leaving for work. I know this type of separation anxiety is extremely common and although difficult to experience, I have taken some comfort in the fact that she genuinely feels she needs me and would rather be with me than in the care of others. I also know, however, that I need to help more with her transition into care. It has been getting increasingly more difficult for me to get away on time and her stress levels must also be through the roof. As a result, I made 5 conscious decisions to ease the stress of the day care drop offs. By acknowledging her feelings not only during the drop off but again when I pick her up, I ensure that she feels heard and understood. I get that it is hard for a child to be left in day care sometimes and I want her to feel that it is normal to be upset. This way she is able to process her emotions and reflect on that time from earlier in the day, knowing that I understood and wasn’t just abandoning her heartlessly. I created a little photo book for my daughter where I print off recent photos of her, her family and her friends and paste them into a book with captions. She can carry this book into day care and show her teachers and her friends. They can talk with her about who is in the photos and what they are doing etc. This helps break the ice and makes her feel more comfortable with her teachers and peers. She is a very social person, so loves being able to show off her book to everyone. The centre now pastes pictures in the book too so we can go through it at home and talk about her day in care. This furthers the connection between home and care and helps her feel more comfortable there. It can be easy to become flustered by the big emotions released by a child being torn from your arms but the last thing they need is to see you falter or exhibit any anxiety, distress or even just uncertainty. So I keep my goodbyes simple and straight forward, projecting the confidence I have in her centre and its carers that she will be well looked after until I return. Routine is important for children. They find a sense of security in the predictability. This gives them a sense of control as they know what to expect and find it easier to make transitions. We had a pretty loose routine so I sharpened it up to make it more predictable and comfortable for Miss 3 to look forward to. We now take the same pathway into the centre everyday. I ask my daughter to choose her locker to place her bag. I sit with her at her chosen activity for 2-3 minutes. I let her know I am leaving, give her a kiss and a cuddle, and say: “I love you and I will be back to pick you up after school. See you then.” Then I walk out and wave to her through the viewing window. I follow these exact steps EVERYDAY so there is nothing unpredictable. Talking through the routine on the way to day care helps to reinforce the predictability of it for my daughter. This practise has had the greatest impact on reducing the stress of the day care drop off for us. I use little pauses between each step to give her time to visualise herself doing these things. I always repeat the routine several times on the way to the centre. I believe that knowledge is power. Knowledge prior to an event allows children time to process uncertainties surrounding it, work through solutions to issues and provide the predictability they thrive on. Each time I go through the routine, Miss 3 lets me know she isn’t going to cry and I gently reminded her that I don’t mind if she does. The first drop off after talking through the routine was such a difference from previous times. When the time came to walk my daughter through the steps we had spoken about in the car. She bounded through each one as though a huge weight had been lifted. She confidently strode from one transition to the next, even stopping to say good morning to the office lady on the way (which she never does). We went into her room and continued through the process. When the time came to kiss, cuddle, and say goodbye, she tightened her grip on my sleeve ever so slightly before letting it go and allowing me to walk away without a single whinge. When I returned that day, she was immeasurably happy and her carers told me she had been buzzing all day. 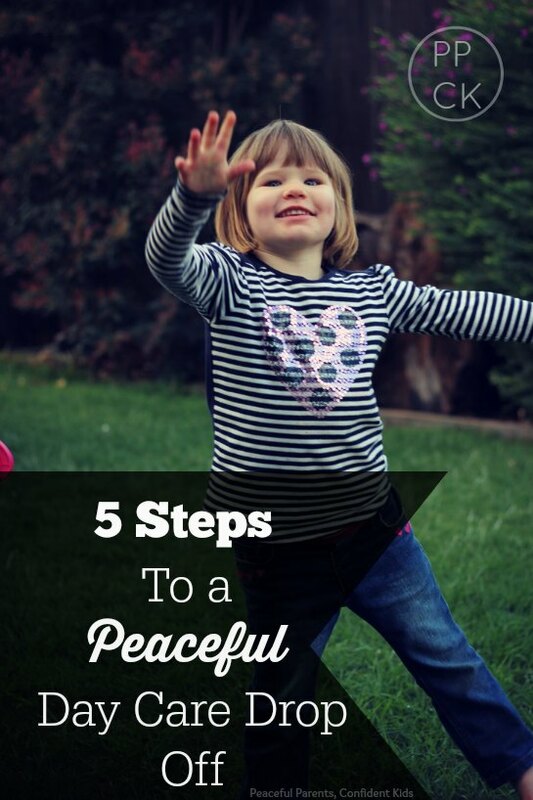 Day care drop offs have become considerably more peaceful since applying these 5 steps. I’d love to hear what works for you when you drop your children off at day care. 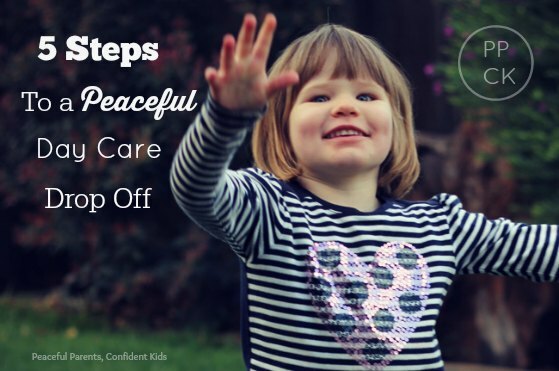 This entry was posted in Building Confidence, Expressing Emotion, Parenting Peacefully and tagged Acknowledging Feelings, Building a Trusting Relationship, Communicating with Babies, Daycare, RIE on June 27, 2014 by peacefulparentsconfidentkids. He does better when a particular teacher is there because she is always able to quickly get him engaged. However, she typically isn’t there when I drop off. That sounds tough, Nicole. All I can suggest is that you trust in his need to express his feelings about you leaving. It can be traumatic for a child to say goodbye to their parents so acknowledge his feelings (without pity) and then, confident that you are leaving him in a safe and secure environment where he will be cared for and loved until you return, leave without lingering. What would you recommend for a 1 year old? My daughter is starting daycare in January and I’m so nervous because she is very attached to me.